For Monique Derksen I checked her Guinean balafoon. She bought it at the time via Arafan Touré. A beautiful instrument! 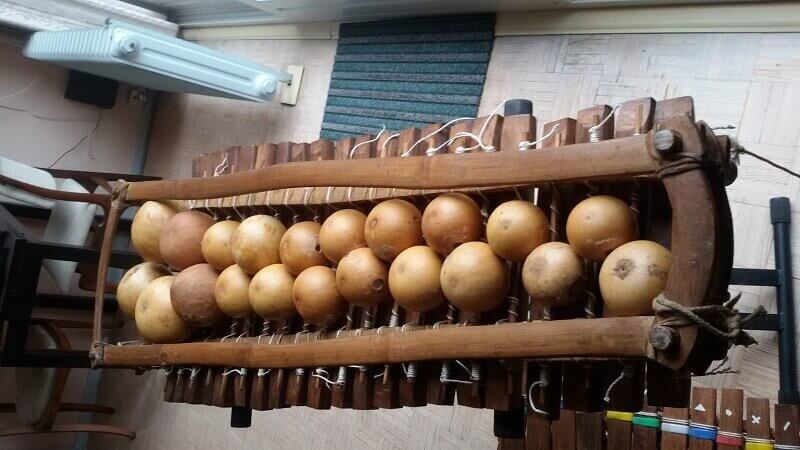 It is a so-called equi-heptatonic balafon. In this tuning the octave is divided into 7 equal pieces. The tones do not therefore come to the tones as we often use them in Western music. It means that you can start any melody in any place on the balafon without affecting the course of the melody. Similar to the equi-heptatonic balafon, there is also the equi-pentatonic balafon. In addition, the pitch in the octave is divided into five equal parts. The sound bars still sounded fine and well matched. Each seventh sound bar sounded an octave higher. They ‘re also tied reasonably well on the frame. In consultation with Monique I left this part untouched . 4 gourds failed. Of the other gourds, a number no longer matched the parent sound bar. Also, some of the membranes covering the holes in the gourds were gone or torn. The intended buzzing effect is then lost and the resonance no longer works between the sound bar and the calabash. The gourds loosened, washed and empty scraped, dried and provided with new membranes. Also applied new strands and then I could tie the calabashes in their correct place. 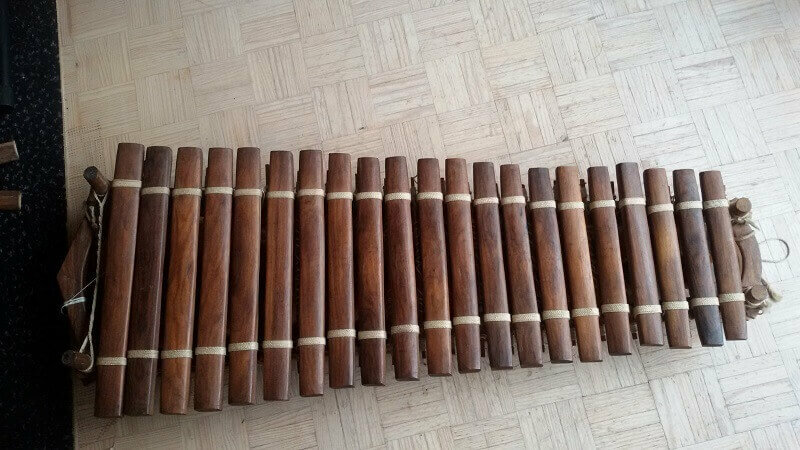 Now the balafon has been restored to good condition. I do not play the heptatonic balafon myself, but only the pentatonic. With lessons on this instrument I can unfortunately not help Monique …. Who does?